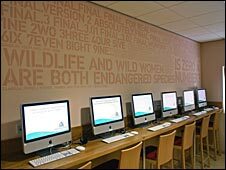 Public libraries in London are revamping the way they do business in a bid to lure more readers. Camden council is set to overhaul the rules in its libraries to allow mobile phones, food, drink and chat. The council is also considering providing computer games to spark interest in the fading institutions. In Hillingdon, west London, libraries have been refurbished, hours extended and Starbucks has been invited to set up coffee shops. In Hillingdon's Ruislip Manor branch, the changes made almost a year ago have led to an increase in visitor numbers by 11,000, with 12,000 more books being lent. Darren Deeks, manager at Hillingdon's newly-refurbished Manor Farm library said: "There's so much going on in the libraries that it's great to see people are getting involved. "We're on a unique site at Manor Farm and welcome visitors anytime." Since its extensive revamp earlier this year, Manor Farm's visitor numbers have jumped a massive 500%, while the number of books being borrowed has climbed by 365%. Officials with Hillingdon council stress that there is more to reinventing a library than just high-end coffee. Councillor Henry Higgins said: "We're bucking the trend in Hillingdon and investing in our libraries whilst others are closing them so it's good to see that our residents are enjoying the new facilities." In Whitechapel, east London, the local library has gone so far as to re-brand itself as the Ideas Store and serves as much as a community meeting place than a lender of books. In Britain last year, 40 libraries closed their doors and the number of books borrowed has fallen by 34% over the past ten years, according to the Society of Chief Librarians.